 The Pasadena Society of Artists invites you to attend the Opening Reception for the 92nd Annual Juried Exhibition. 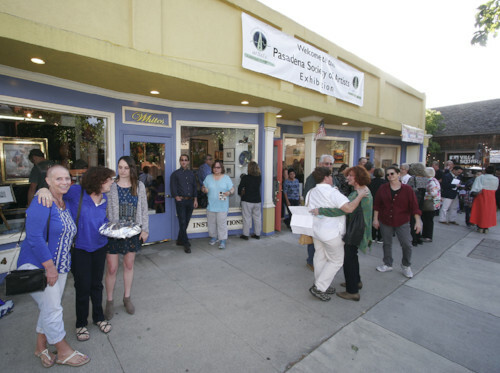 The celebration starts at 5 pm on Saturday April 1 at White’s Fine Art Gallery located at 2414 Honolulu Avenue in Montrose. 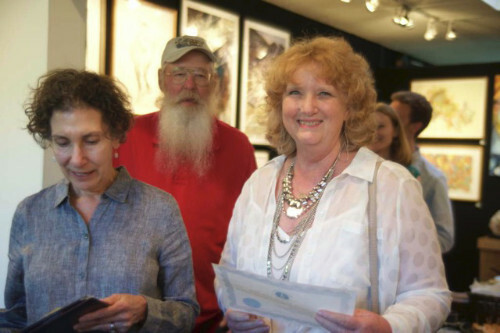 See a spectacular exhibition of 110 new and original artworks created by fifty-one PSA members. 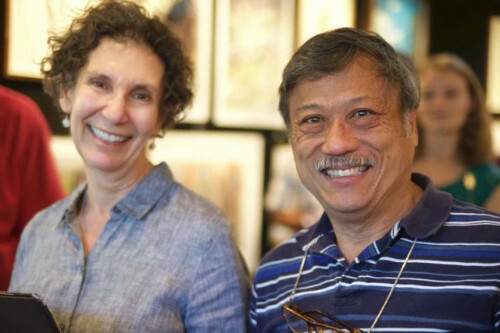 Meet the artist and discuss their work while enjoying light refreshments and hors d’ oeuvres. 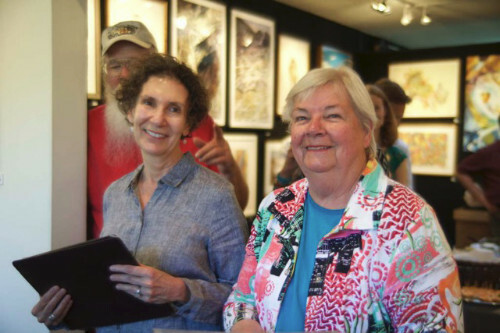 Artwork is presented in oil, acrylic, watercolor, etchings, traditional and digital photography, stone sculptures, clay sculptures, bronze sculptures, ceramics, encaustic, pen & ink, mixed media, embossing and watercolor monoprints. 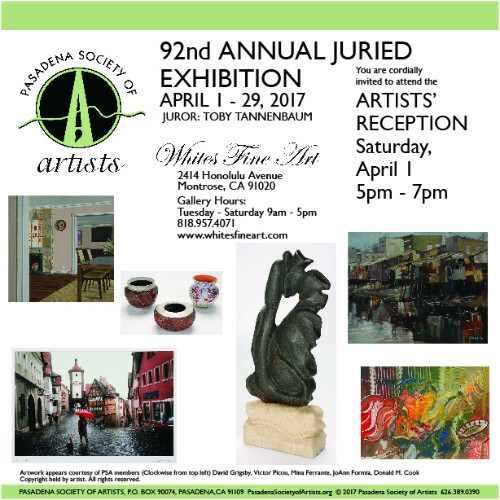 The 92nd Annual Juried Exhibition is open from Saturday, April 1 through Saturday, April 29, 2017. 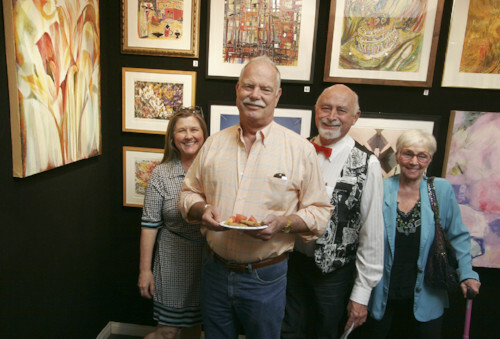 White’s Fine Art Gallery hours are Tuesday – Saturday 9 am to 5 pm. 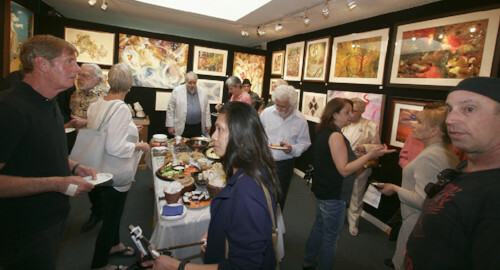 Additional information is available at www.whitesfineart.com or calling 818-957-4071. Click HERE for a full catalogue of the exhibition. 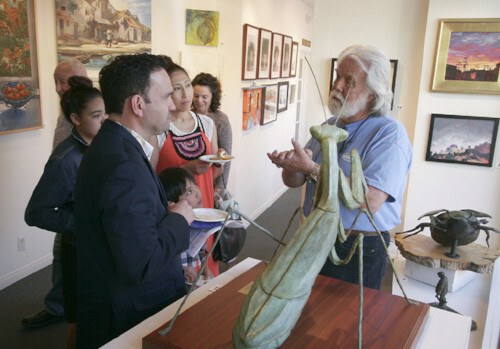 PSA member Jim Marshall explaining his technique used to create "Lady Mantis" to PSA member Aaron Gil and his family. The gallery is filling up with interested visitors and PSA members. Another fabulous table of hors d'oeuvres by the PSA Hospitality crew and members. Toby Tannenbaum, Juror for the 92nd Annual and PSA President Victor Picou. 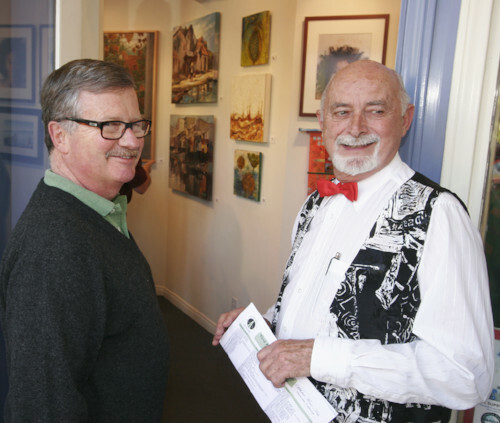 PSA member David Crandon talking with President Victor Picou. President Picou with two admirers. 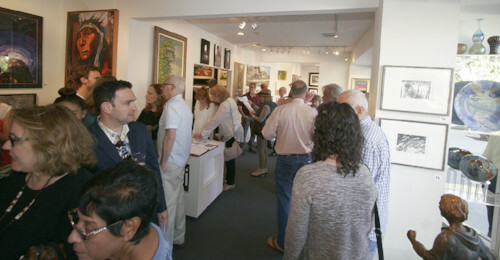 An overflow crowd at the opening reception for the 92nd Annual Juried Exhibition. 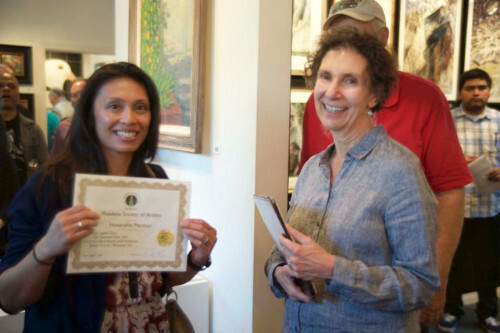 Award winner Jaydee Dizon with Toby Tannenbaum, juror. 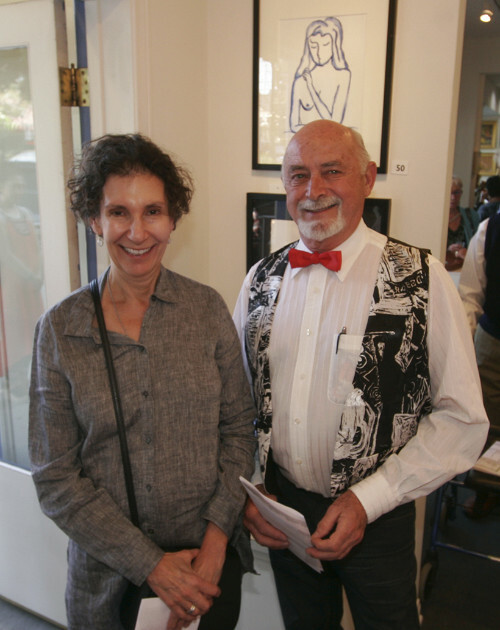 Award winner Chuka Susan Chesney with Toby Tannenbaum, juror. 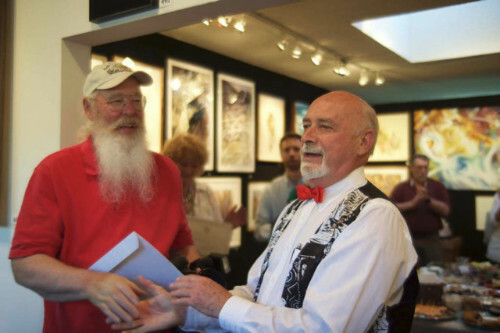 Award winner Fred Chuang with Toby Tannenbaum, juror. 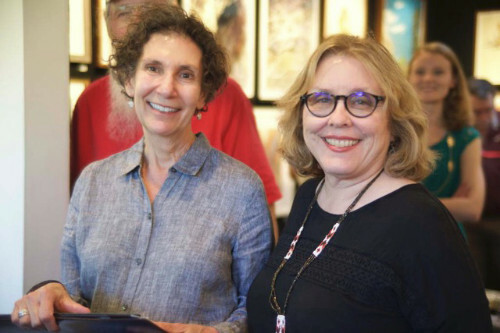 Award winner JoAnn Formia with Toby Tannenbaum, juror. 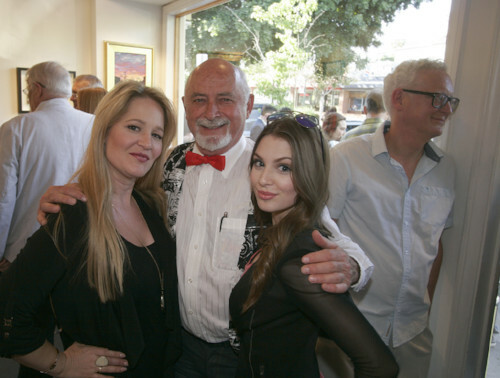 Award winner Renee Rusak Strouse with Toby Tannenbaum, juror. President Victor Picou presenting a Certificate of Appreciation to Lawrence D. Rodgers, PSA's Director of Exhibitions.